Vickie had traveled around the United States, Canada and Europe for years before her very first visit to Walt Disney World with her family in 1992 - and it was love at first sight! After years of extensive “research” and planning trips to Walt Disney World for friends and family, she officially started in the travel business in September 2001. Vickie has visited Walt Disney World more than 35 times since that first trip in ‘92, staying at almost every resort on property, and has made numerous trips to Disneyland in California, as well as many Disney cruises – to the Bahamas and the Caribbean, across the Atlantic and through the Panama Canal. Vickie loves nothing better than “talking Disney” with other fans and with clients visiting for the first time. Now that their children are grown, Vickie and her husband, Mike, enjoy more frequent getaways. 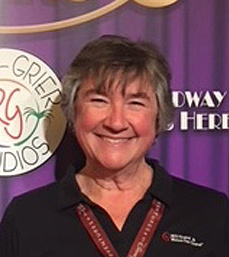 Besides Disney travel, they have ventured farther afield as often as possible, which has enabled Vickie to garner considerable experience with other cruise lines (including river cruising) and vacation destinations. After 16 years as a travel agent, she loves sharing her knowledge and experience with her clients, as she aids them in planning the best vacation experience possible!